Edward Hopper’s painting East Wind Over Weehawken has sold for $40 million, setting an auction record for the US artist. 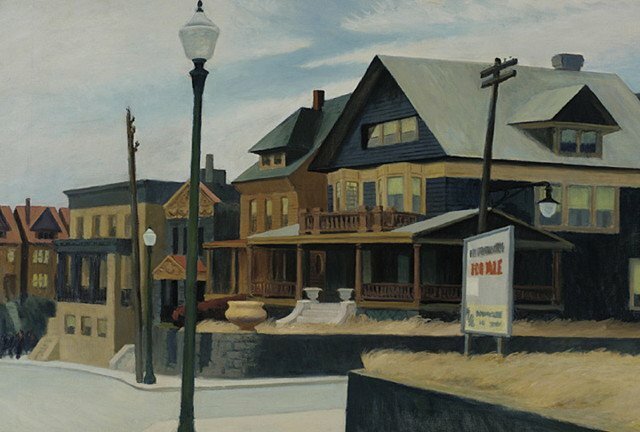 East Wind Over Weehawken, a Depression era view of New Jersey created in 1934, was sold by Christie’s to an anonymous telephone bidder for almost double its pre-sale estimate. The previous record was $26.9 million, set in 2009, for his work Hotel Window. Edward Hopper, who died in 1967, was famed for his depictions of modern American life. The realist painter gained widest recognition for his work in oils, but also produced prints and watercolors which encompassed both urban and rural scenes. East Wind Over Weehawken, which he considered one of his best artworks, was part of the Pennsylvania Museum of the Fine Arts’ collection for more than 60 years. The proceeds will be used to create a fund for the purchase of new artworks. The painting depicts a desolate, dark green clapboard house with a “For Sale” sign beside it, reflecting the melancholy of the time.